Excuse our dust! The site is getting a facelift. Check back often as we will be posting lots of new videos. THE "ROOK" WOOD BURNING STOVE IS AVAILABLE NOW IN THE 2JOLLYROGERS STORE! What the heck is a "Jack Stove" and why do I need one? If you spend time in the outdoors then this is for you. If you don't, then this is a great gift for someone who does. The Jack Stove Cook Set is a purpose built cook set with the outdoors in mind. You can keep the whole cook set in your saddlebag for making hot drinks while waiting out a storm under an overpass or making a quick meal between gas stops. Take it ice fishing and make hot soup while waiting for that next big catch. Take it camping and use it as a light weight cook set for 2. Take it backpacking and cook all of your freezer bag meals. Keep it in your emergency preparedness kit for boiling and sterilizing water. The Jack Stove Cook Set is a complete multi-purpose cook set that meets the needs of many different outdoor activities. You can carry it as a complete set or tailor it to your specific needs. 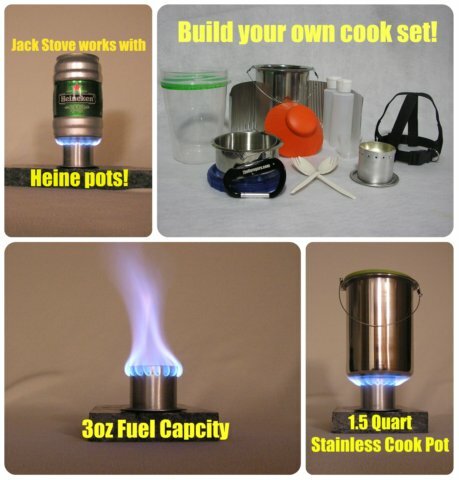 The Jack Stove is an aluminum dual-walled, low pressure stove with a 3oz fuel capacity. It burns denatured alcohol, methanol, (yellow Heet) , and grain alcohol (Everclear). This means fuel is inexpensive and easily acquired at most gas stations, hardware and liquor stores. It burns for over 9 minutes on one ounce of fuel and boils 2 cups of water in just over 7 minutes. It is sturdily built and is complete with a corrugated aluminum windscreen and primer pan for quick starts and consistent burn times. It works well with small/medium cook pots such as Heineken pots or the Snow Peak 600. The best part is that there are no moving parts to break and no o-rings or seals to go bad. The cook set contains a 48oz stainless steel cook pot, an 8oz stainless steel cup and a 32oz BPA free Ziploc storage container that are all durable and easy to clean. You also get 2 5oz leak-proof bottles with flip-top caps that can be used for fuel or cooking oils. Another feature is the Copco jar opener which works wonderfully as both a pot grabber and a lid for any cup or cook pot up to 4" diameter. All of this is packaged together in a durable 300 denier nylon stuff sack with the 2jollyrogers logo on the front.